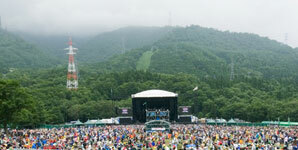 All the artists, audience and staff together make Fuji Rock Festival the perfect place to enjoy music, meet new people and open your mind. High up in the mountains, far away from city life and daily grind, you'll love this festival and it's unique atmosphere. If its your first time you may find festival life a new experience: walking long distances from stage to stage, queueing for toilets, trying to see all the artists on the many stages.